England captain Alastair Cook says there are places to be won in the Test side to face Sri Lanka in June. Cook, 29, averaged 24.60 during the 5-0 Ashes whitewash in Australia over the winter, but scored a century for Essex on Monday. Ian Bell and Sam Robson also made tons for their counties this week. "It's an exciting time in English cricket in that, for the first time in a long time, there's quite a few places up for grabs," Cook told BBC Essex. "That happens when you lose games of cricket - and we lost five pretty heavily." 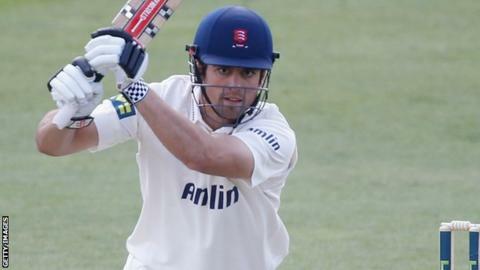 Cook managed a second-innings total of 181 in Essex's County Championship Division Two game against Derbyshire this week, hitting his first century since making 154 for England against Australia A last November. Bell also struggled with the bat in Australia, passing 50 only twice in 10 innings, but his 189 not out for Warwickshire against Sussex will have pleased selectors. England Lions batsman Robson enhanced his claims for an opening position alongside Cook with a knock of 163 for Middlesex against Nottinghamshire, while fellow Test hopeful and team-mate Eoin Morgan struck 86. "Everyone knows there are places up for grabs and good performances in the County Championship over the next few months will push peoples' claims," said Cook. "I don't think you rule anyone out. "I've hit the ball quite nicely myself over the last few weeks or so. It's nice to go on and make a sizeable contribution." The Tests against Sri Lanka take place at Lord's, from 12-16 June, and Headingley, from 20-24 June.